-13- It was [[underline]]really[[end underline]] a good feeling, I'll tell you. And so now I want to speak of things I felt and was not able to say then... I flashed on sitting together with you on occasion and exchanging adventures. i thought of the stories I would like to share with you the way our people shared stories in far off times. I wanted to relate what I know of those times past, to the things we mutually share as a result of our experiences here in the Americas. I wanted to hear your thinking on these things - maybe we could journey together along the track of the parallel concepts of genetic engineering, diminishing resources, psychological management techniques, E = MC2, the point in infinity where concepts come together...I wanted to speak sincerely with you, exchanging, relating with what we know. I wanted to discuss mathematics and science, words that have almost magical meaning to us: magical because of some mutualities in our experience. Yes, I wanted to speak of the relatedness of things that seem unrelated. I wanted to solve the riddle of the tesseract with you as our people sat together to solve the riddles of the Universe in the past. The enigmatic acceptance reflected in the structural symmetry in the concept, "sphinx." The flowing geometry of the pyramids in Giza, and in Teotihuacan. The paradox of Pythagoras... i wanted to participate culturally with you as our people have participated in the past: face to face, in small groups, telling the stories that have been handed down, generation to generation. Stories that are being lost now. The sitting together and telling of stories was one of the ways all people before the advent of modern times, maintained the intimate continuum of past and present. Modern times, through various technological means, interrupts the continuum, and as in genetic engineering, splices on bits of information calculated to have a general effect in the hypothetical time continuum of the future. Few of us can speak of the things our parents did, as deeds. Fewer still of gradparents or great-grandparents. Do we sit sometimes, with other than memories? "I remember when..." "For many years now, this small section of earth has been covered with concrete, and in no part of itself could it celebrate the coming Spring. But today was somehow different..." "...and when the professor said that the structure of the hydro-carbon molecule was tetrahedral, I remembered how my grandfather described the structure of our Universe in terms of the four elements..." It is when we are able to sit together and relate information to our personal experience or the experience of our ancestors, that learning occurs. I thank you for inviting me to share time and space with oyou, and I thank you for your warm reception. 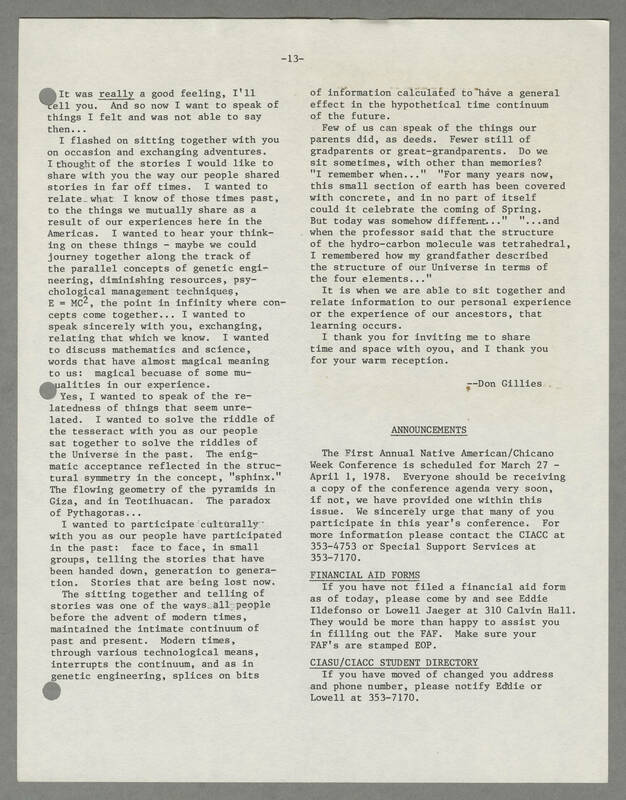 --Don Gillies [[underline]]ANNOUNCEMENTS[[end underline]] The First Annual Native American/Chicano Week Conference is scheduled for March 27 - April 1, 1978. Everyone should be receiving a copy of the conference agenda very soon, if not, we have provided one within this issue. We sincerely urge that many of you participate in this year's conference. For more information please contact the CIACC at 353-4753 or Special Support Services at 353-7170. [[underline]]FINANCIAL AID FORMS[[end underline]] If you have not filed a financial aid form as of today, please come by and see Eddie Ildefonso or Lowell Jaeger at 310 Calvin Hall. They would be more than happy to assist you in filling out the FAF. Make sure your FAF's are stamped EOP. [[underline]]CIASU/CIACC STUDENT DIRECTORY[[end underline]] If you have moved of changed you address and phone number, please notify Eddie or Lowell at 353-7170.